More recently however, dentists have begun to rely on 3D imaging techniques to provide them with a detailed view of the mouth and skull. The advantage that 3D imaging holds over regular dental x-rays is that bone structure, bone density, tissues, and nerves can be viewed clearly. Scans can be completed in less than half a minute. This means that far less radiation enters the body than if a regular set of bitewing X-rays were taken. 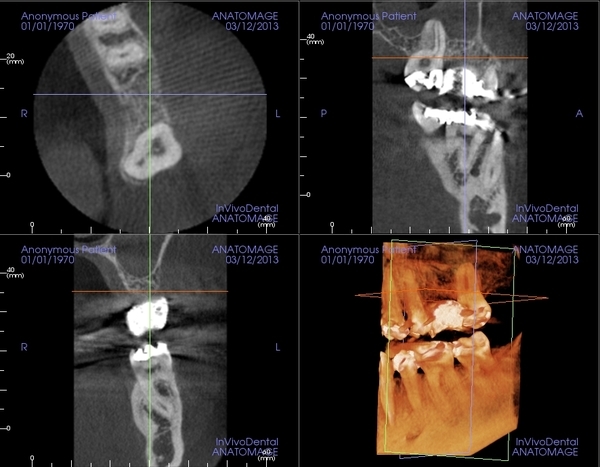 The main use for i-CAT® scans is as an aid to plan dental implant treatment and other oral surgery. Cat scans are advantageous because they allow the dentist to magnify specific areas of the face. In addition, the dentist can easily view cross-sectional “slices” of the jaw, which makes planning treatment easier and faster. CAT scans are quick and simple to perform. A Cone Beam Imaging System is at the heart of the CAT scanner. During the scan, the patient sits stationary on a designated seat. The cone beams are used to take literally hundreds of pictures of the face. These pictures are used to compile an exact 3D image of the inner mechanisms of the face and jaw. The dentist is able to zoom in on specific areas and view them from alternate angles. Previous patients report the CAT scanner is comfortable because they remain in a sitting position at all times. Additionally, the scanner provides an open environment, meaning that claustrophobic feelings are eliminated. The CAT scan is an incredible tool that is minimizing the cost of dental treatment, reducing treatment time and enhancing the end results of dental surgery.